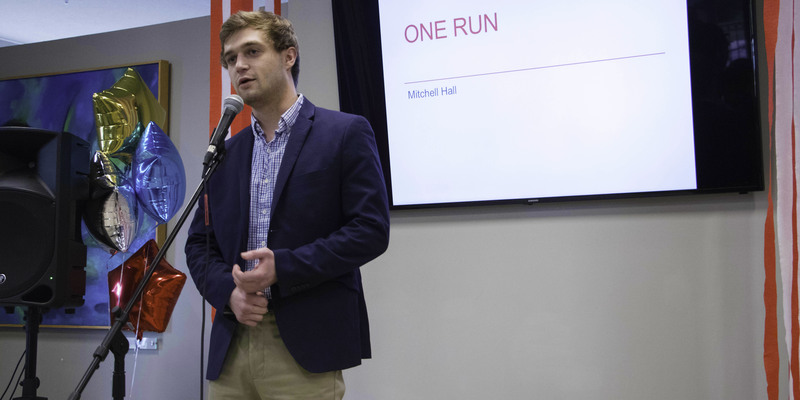 The University of Delaware Horn Entrepreneurship fall pitch party will be held at the Venture Development Center from 3:30 p.m. to 6 p.m. on Wednesday, October 24. Undergraduate students from any college may pitch but any UD student, faculty or staff, may watch. The event is free but to pitch or attend you must register at bit.ly/undertheseapitch. The under-the-sea-themed edition of Horn Entrepreneurship’s biannual pitch competition encourages students and first-time presenters to sharpen their pitching skills and display their best entrepreneurial ideas in a fun and friendly environment. Andrew Cercena, Entrepreneurship and Technology Innovation, Class of 2021, pitched his business concept as a freshman. Horn Entrepreneurship invites you to join in the under the sea fun, which will include a buffet of your favorite tropical snacks, fun music and local expert judges available to network with students. The Venture Development Center is located on 132 E. Delaware Ave. Entrance and appetizers begin at 3:30 p.m.
Students who plan to pitch or attend must register before October 18. Only UD undergraduates are eligible to pitch. If you happen to be a on a team of graduate and undergraduate students, only the undergraduate student(s) are allowed to pitch. Past participants in Summer Founders, NSF I-Corps, Proof of Concept, Hen Hatch semi-finalists, and prior Pitch Party winners are not eligible to pitch their same idea. Registration will end at 11 p.m. Thursday, October 18. Sign up to pitch or watch at bit.ly/undertheseapitch.